+$The Nokia game comes to Google Maps on Android and iOS. +$For readers of a certain age, the game Snake will bring back hazy memories of squinting at the screen of a Nokia 3210 as you furiously try to beat your best mate's high score. 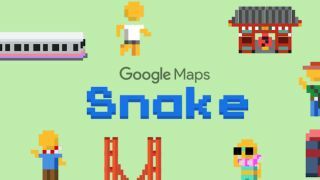 To give people the chance to relive the classic game, Google has added a version of Snake to Google Maps today as an April Fool's Day treat. +$Rolling out worldwide today across Android and iOS, Snake on Google Maps sees players control buses and trains instead of a slithering serpent. The aim of the game is still the same though: players have to gobble up objects, in this case tourists and famous landmarks, while making sure they don't overlap themselves or run off the map. After a few goes, you'll realise (or remember) that this isn't as easy as it sounds. +$Players get to choose from a variety of locations from Google Maps, including Cairo, London, San Francisco, São Paulo, Sydney and Tokyo. Each map and its associated landmarks are picked out in colourful像素艺术+$, ensuring that this version of Snake brings out all of your '90s nostalgia. +$According to Google Maps product manager Omar Abdelaziz, Snake on Google Maps will be available in the app for "about a week". However, if you just can't get enough of the game, you'll be pleased to hear that it has a+$standalone Site+$, so you will be able to keep playing "long after April Fools is over." +$As far as pranks go, Google is playing it very safe this year. That's if you can even call Snakes on Google Maps a prank. However, given that your social media feeds have probably been inundated with joke stories this morning, we appreciate that the search engine giant is saving you a bit of hassle by being upfront with its mild tomfoolery. +$Another reason that Google is treading carefully around April Fool's Day could be related to a 2016 prank that backfired. That year Google launched the 'Mic Drop', a feature which temporarily replaced the 'Send and Archive' button. By clicking 'Mic Drop', users sent everyone in the conversation a GIF of a Minion dropping a microphone, as well as stopping further replies from appearing in your inbox. +$The Mic Drop prank caused headaches for companies, with at least one freelancer losing work as a result of it burying their replies. Hilarious. In response to the fallout, Google issued an apology and deactivated the feature, so we can't really blame it for not taking a risk this April Fool's Day.